SFC EFOY PRO and EFOY GO ! For a Free Consultation, Demo & Trial, Send Us Your Email! Electrical comforts of your home, onboard your boat. Anytime, anywhere. 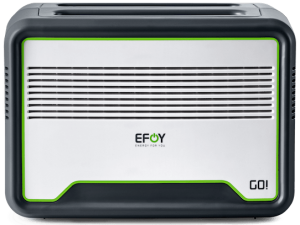 EFOY PRO 365 days of freedom away from the grid The fully automatic, green, silent power generator works anywhere, in all weather conditions. 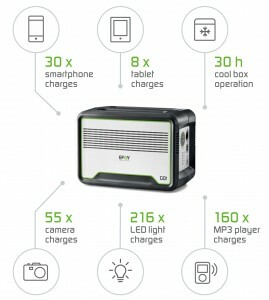 How It Works The EFOY PRO automatically charges the consumer battery to full capacity. 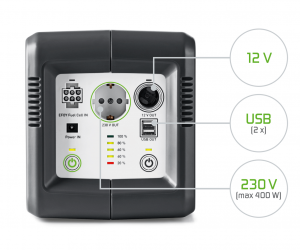 The integrated charge controller permanently monitors the charge level of the 12 V battery. If necessary, the EFOY PRO starts automatically and switches off again once the battery is charged. With an inverter, you can also use 230 V devices. The EFOY PRO produces electricity using the fuel in the fuel cartridge, adding oxygen from air. In addition to electricity, it only produces waste heat and water vapour containing an insignificant amount of carbon dioxide. EFOY GO ! is a smart battery. With an integrated inverter and four power connectors, you also have convenient power – plug and play – away from the grid. 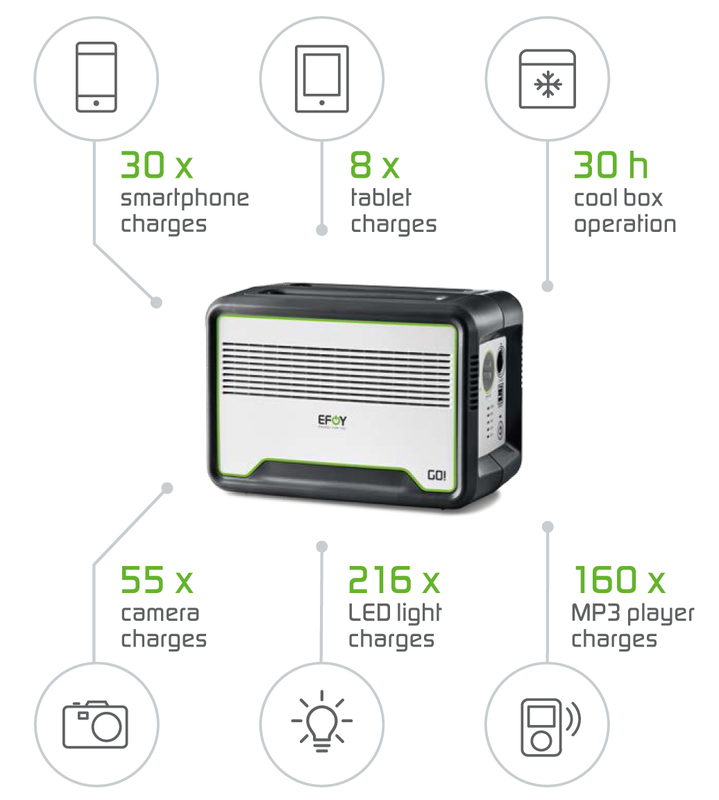 Whether for a smartphone, a camera or a cool box, the compact, lightweight EFOY GO ! uses state of the art lithium technology to deliver ultimate power with the smallest of dimensions. Ideal for your outdoor adventure! You can easily use your electronic devices – plug & play – when you’re on the road. Charging EFOY GO ! is child’s play too. At home, you can simply plug the EFOY GO ! into a socket, away from home you can use a solar panel and in the car you can use a 12V socket. EFOY PRO and EFOY GO ! Need more power for holidays, trips or stays in your boat or yacht? Then combine the EFOY GO ! with EFOY PRO Fuel cell for non-stop power. 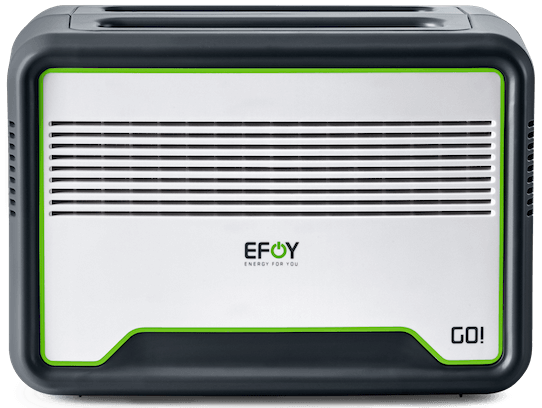 The EFOY PRO fuel cell plus the EFOY GO ! combines the best environment-friendly technologies in one solution. Whilst the EFOY GO ! provides a portable socket, the EFOY PRO delivers automatic charging.